A fantastic dinner side made with fresh apples. 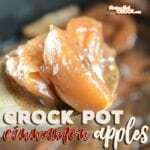 Place your apples in your 6 quart slow cooker. In a bowl, mix your sugars and cinnamon and then sprinkle on top of your apples. Cover and cook on low for 4-5 hours, occasionally stirring. We cook this up in our 6 quart slow cookers like this one. This is a dinner side dish recipe. If you want your apples to be sweeter, you will need to add more sugar to taste. We used gala apples but you can use the apple of your choice.